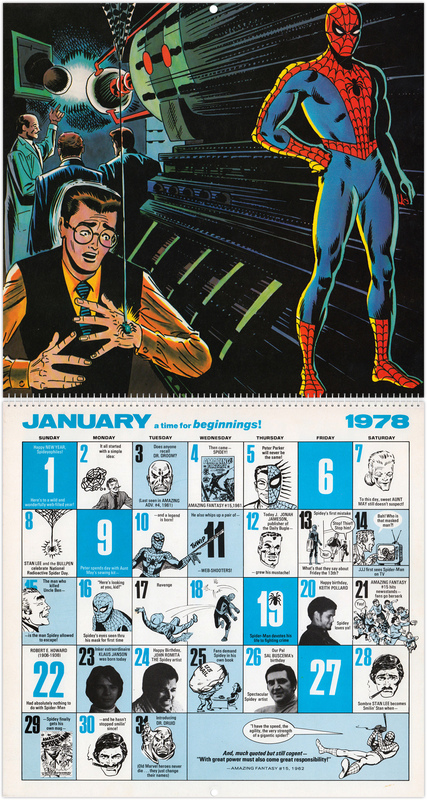 The Amazing Spider-Man Mighty Marvel Comics Calendar 1978 | 'TAIN'T THE MEAT… IT'S THE HUMANITY! 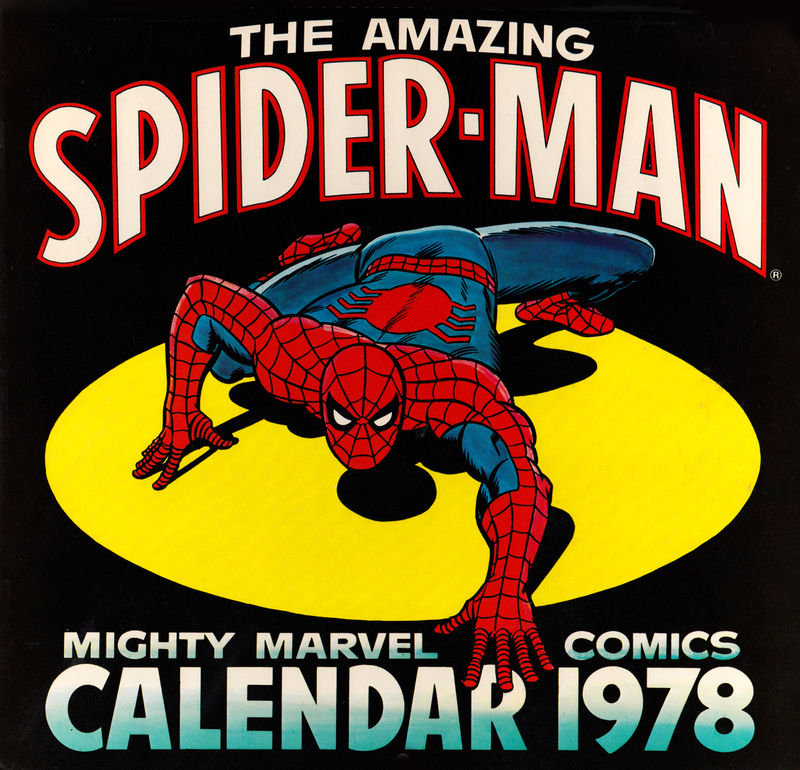 The Amazing Spider-Man Mighty Marvel Comics Calendar 1978 was the fourth calendar published by the comic book giant and, along with sporting an extremely long title, included new artwork of Marvel’s biggest star by some of the publisher’s most popular artists. 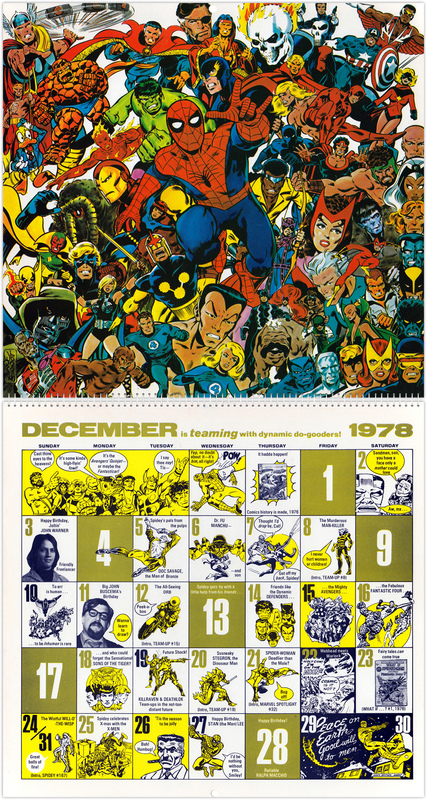 Between 1975 and 1981 Marvel Comics released seven calendars that not only featured new artwork from their bullpen of artists, but also included notable events from their character’s history, as well as staff birthdays and mugshots. 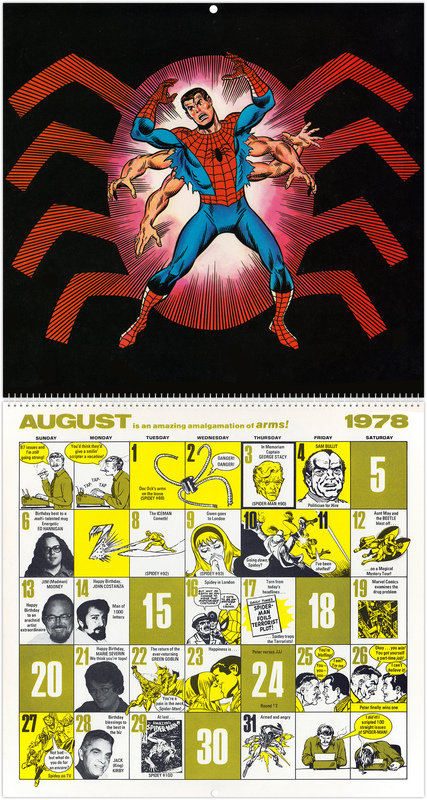 In 1978 Marvel broke from their established format of shoe-horning as many of their superheroes into one calendar as possible, and instead focused the entire calendar on their biggest star: The Amazing Spider-Man. 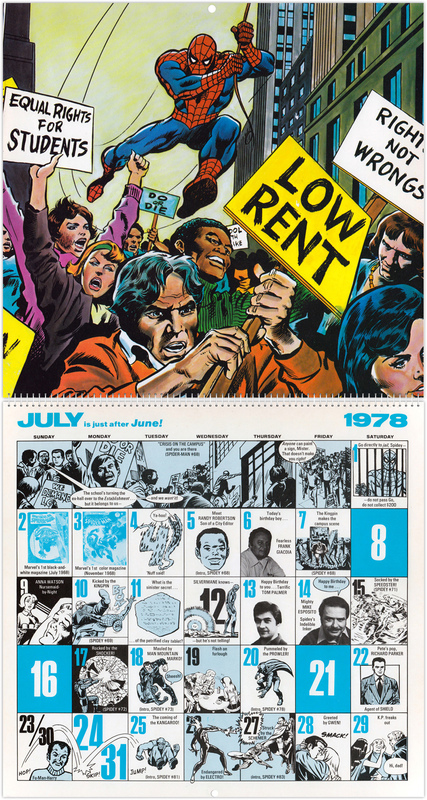 The spiral bound calendar measured 11½ x 11 inches, featured 1978’s dates along with 12 new full-colour illustrations and sold for $4.95. 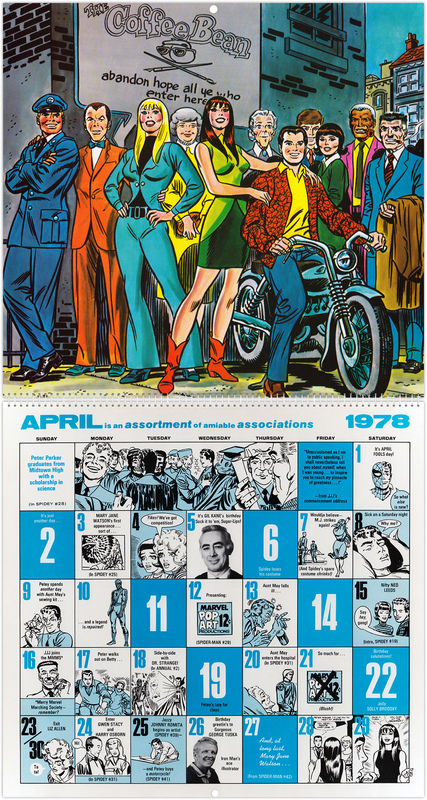 Almost every day of the year was illustrated with either a small piece of reprinted artwork, a staff member’s birthday or some other notable event. Ever wondered what Sal Buscema looked like? Or when to send him a birthday card? Then wonder no more (his birthday was January 26th). 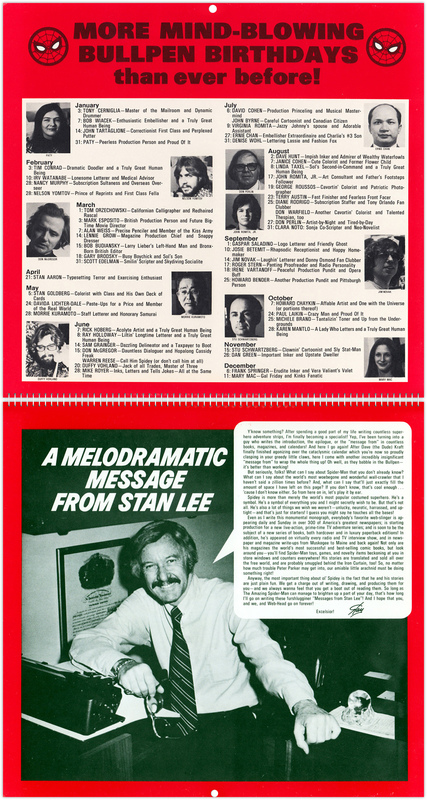 Also included in the calendar was a “Special Editorial” introduction and at the back more staff birthdays were squeezed in, as well as a personal message from Marvel head-honcho (and Spider-Man co-creator) Stan Lee. 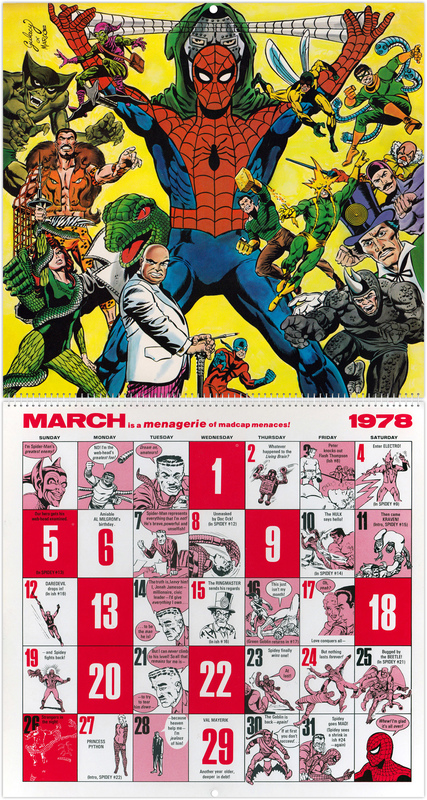 The Amazing Spider-Man Mighty Marvel Comics Calendar 1978 showcased the artwork of some of Marvel’s most popular artists and inkers. 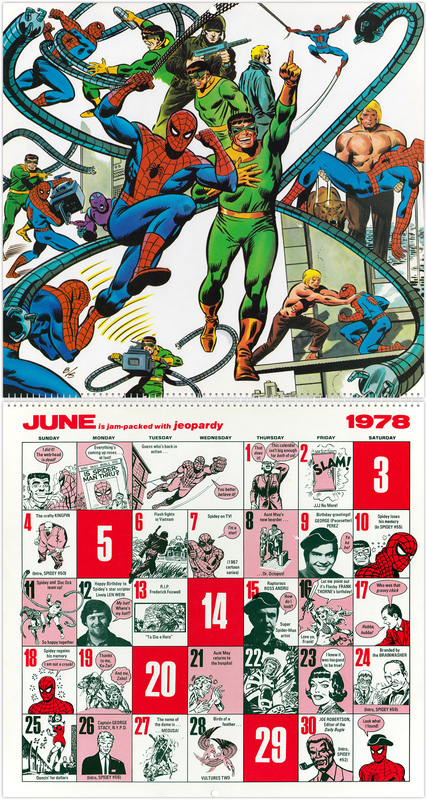 Regular readers would have instantly recognised most, if not all of the contributors to the calendar — Al Milgrom (January), Jack Kirby and John Verpoorten (February), Paul Gulacy and Pablo Marcos (March), John Romita (April), Larry Leiber and Frank Giacoia (May), John Buscema and Joe Sinnott (June), Gene Colan (July), Sal Buscema (August), Gil Kane and Tom Palmer (September), George Perez (October), Ross Andru and Mike Esposito (November) and John Byrne (December). 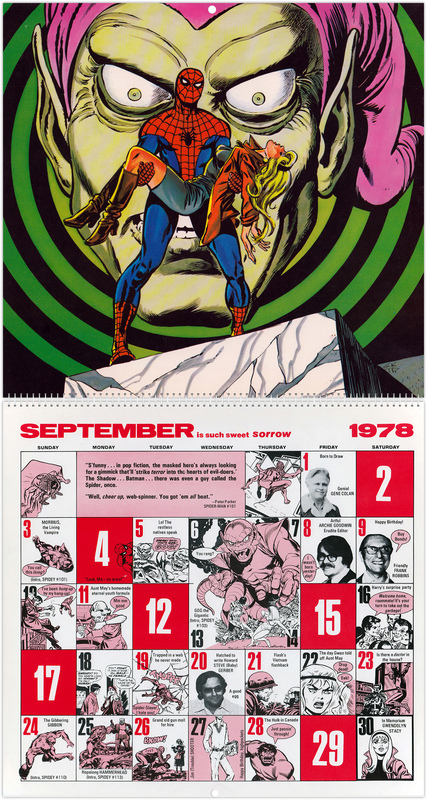 The calendar was a veritable who’s-who of Marvel’s artistic talent. 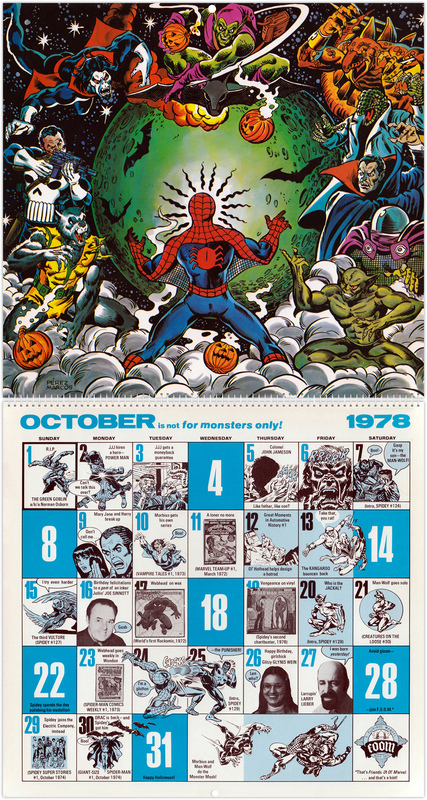 When I was a kid I always looked forward to the release of a new Marvel calendar, they were just great fun. 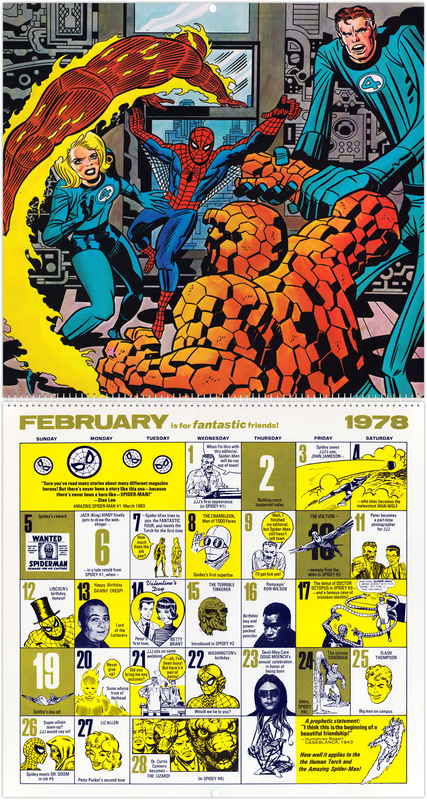 Marvel had always encouraged and maintained a chatty familiarity towards its fans, and their calendars were no exception. 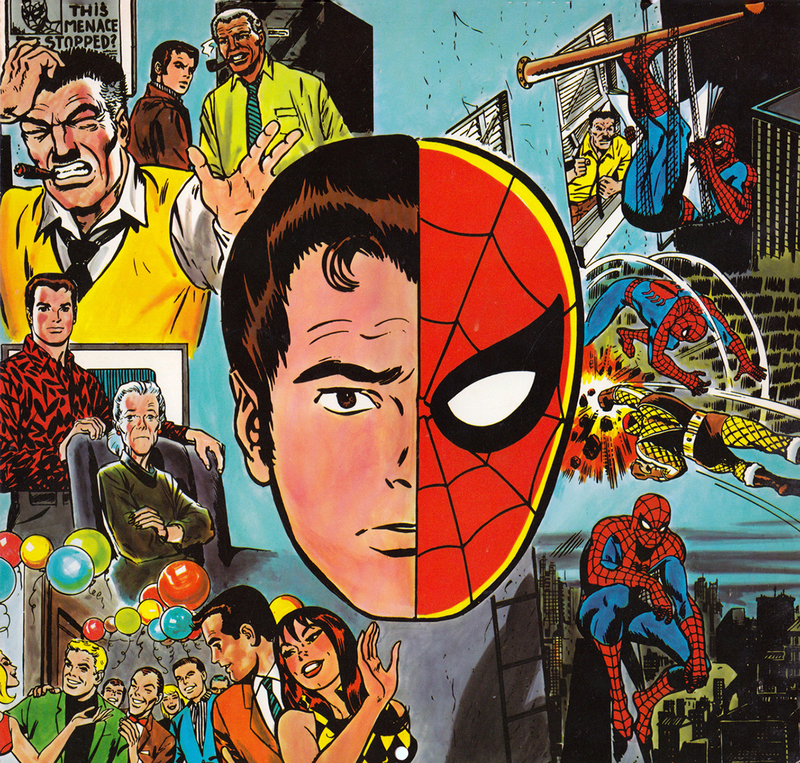 And the artwork was great too, with some of Spidey’s most memorable events celebrated. For May Larry Leiber and Frank Giacoia did a great job paying homage to the classic ‘Spider-Man No More!’ storyline from The Amazing Spider-Man issue #50. 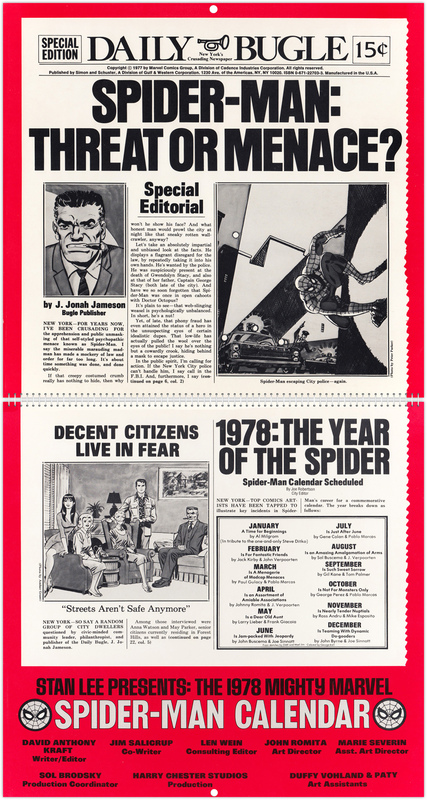 Gil Kane and Tom Palmer’s entry for September recreated the death of Gwen Stacy from issue #121, while Sal Buscema and John Verpoorten reminded us of the (in) famous six-armed-Spidey story from #100. My favourite though was John Byrne and Joe Sinnott’s entry for December — apart from being a massive Byrne fan, I just loved how he managed to cram almost every Marvel superhero into one drawing. 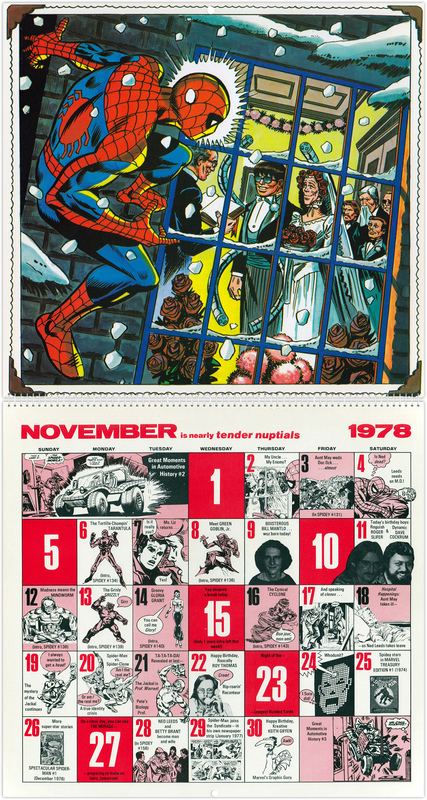 Here are all the pages from The Amazing Spider-Man Mighty Marvel Comics Calendar 1978, click for larger versions. 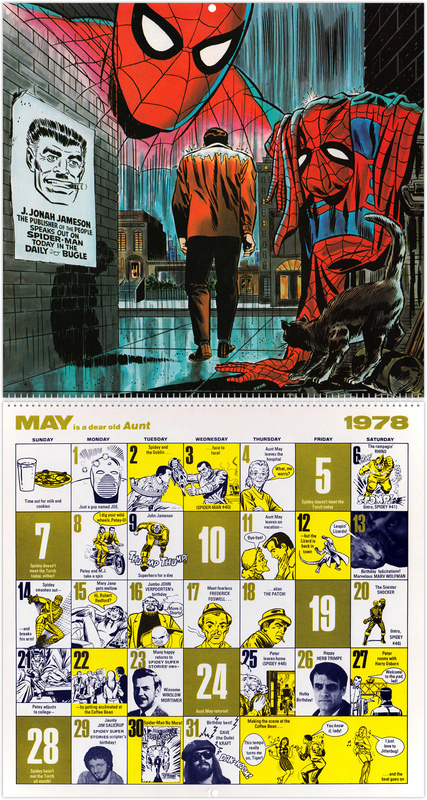 For those still in the calendar mood I’ve already looked at five other Marvel Calendars: Mighty Marvel Calendar for 1975; The Mighty Marvel Bicentennial Calendar 1976; Marvel Comics Memory Album Calendar 1977; Marvel Comics Calendar 1980: The Occult World of Doctor Strange, and Marvel Comics 20th Anniversary Calendar 1981.